It's the first weekend in September. Our son is moving to Oregon on Thursday. His wife and the three Grandlittle girls are staying in Arizona for now until he's sure he'll stay in Oregon instead of being transferred out. I'm not talking about the Grandlittles moving. 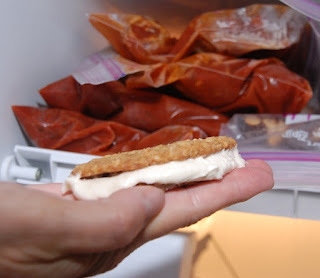 Since our son is going to be 'batcheloring' it AND he's driving up, my Mom helped me figure out how to send some home-cooked love along with him to stock his freezer. Also in my freezer are: Oatmeal Cream pies, peanut butter cookies, oatmeal cherry-raisin cookies, triple chocolate brownies and butterscotch chocolate cookies. It is very hard to resist my freezer right now. The oatmeal cream pies are afraid to go to Oregon. They really, really want to stay right here...close to my mouth. I'm telling them they have to leave, but they aren't taking it well. Perhaps I should comfort one of them. put it gently in my mouth. Because that's what a labor of love is for on Labor Day weekend. ...and possibly a homemade oatmeal cream pie cookie! I can't imagine one of my kids moving far away, I just can't! I won't even discuss the possibility of my grandkids leaving me, too. HOW TERRIBLY HARD THIS MUST BE FOR YOU! You have my sympathies. PS: I haven't forgotten that email. I will answer it. Wow, you've cooked up a storm! I promise to do that as soon as it cools off. I don't want to think of your grandbabies moving away, either! Great job Mom to send some homemade goodies with your Son! Hope all works out for the family! BIG HUGS! oh Jenny, those grandlittles simply can't move away. You and Mr. Jenny will just have to follow - can you follow? I mean the pies, they will be ok without you, in fact they just might be better off without you but the grandlittles...nope. You are such a good mom, Jenny! That would be hard if the grandkids moved away. Would you consider following them to Oregon if and when that happened? Oh what a sweet mommy you are! I'm hoping for the best and that your darling grand-delights won't be pulled so far away! Yikes for sure! You might just have to move to lovely Oregon too! Happy Labor Day to you too Jenny....hope it's filled with joyful fireworks and bonfires with yummy roasted marshmallows and fun campfire stories! Hope all works for your son and his family! A little far though. I guess you'll be going to Oregon A LOT when they get settled. oh my gosh ... i cant bear to think of your grandlittles moving either ... that bites! and that cookie .... it looks yummy! DID make a double batch for you to have half ? Share your tangents...am here to listen to your "vents" I'd have many in your place. You are such a thoughtful mom -- making a care package for your son! SO--will you share your oatmeal cream pie recipe with us? Pretty please! I have 9 grandkids. Only 3 live in my town--the other 6 are in different time zones, far, far, away :-(. It's hard to be a long distance grandma. Oh no, Jenny! I know the frustration of being a long distance grandmother, that is why I am over the moon happy to be moving to Colorado even through it means leaving my beloved NYC behind. Family is everything...do you think you and Mr. Jenny would be able to move to Oregon too if that time comes? Yum! That cookie would be hard to stay away from...resist the force! I won't talk about your grandbabies moving away either- but I will send some prayers up for travel blessings and hope they all settle in quickly to their new environment! I'm sure you and the mister will be traveling to Oregon a lot! Oregon is too far. I am putting my foot down. Actually, I am putting BOTH feet down. But...you are the sweetest Mom ever. I want to get in your freezer!!! Your son should move to Brunswick so he can SHARE!!! My kids are free to move anytime, but they better think again about trying to take their kids! It just now hit me that I really don't want to think about that either... Enough on that, I want oatmeal cream pie cookie!